Executive Director Ian Andrews at 1427 Scenic Street. 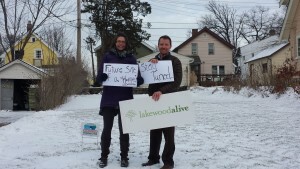 Earlier this month, LakewoodAlive took title to a small parcel of vacant land at 1427 Scenic Street off of the Detroit Extension. This is the first time the non-profit has held title to property. The land was previously owned by the Cuyahoga County Landbank following demolition of a dilapidated property several years ago. Through a partnership with the Landbank and the City of Lakewood, the property was transferred to LakewoodAlive for the development of a single-family home. After going through an exhaustive request for proposal process in late November/early December, a developer was selected to purchase the parcel from LakewoodAlive with the intent of building a new, single family home. The Prairie Stone Group will break ground later this winter/early spring, build and sell the house. Stay tuned for updates as the project commences.